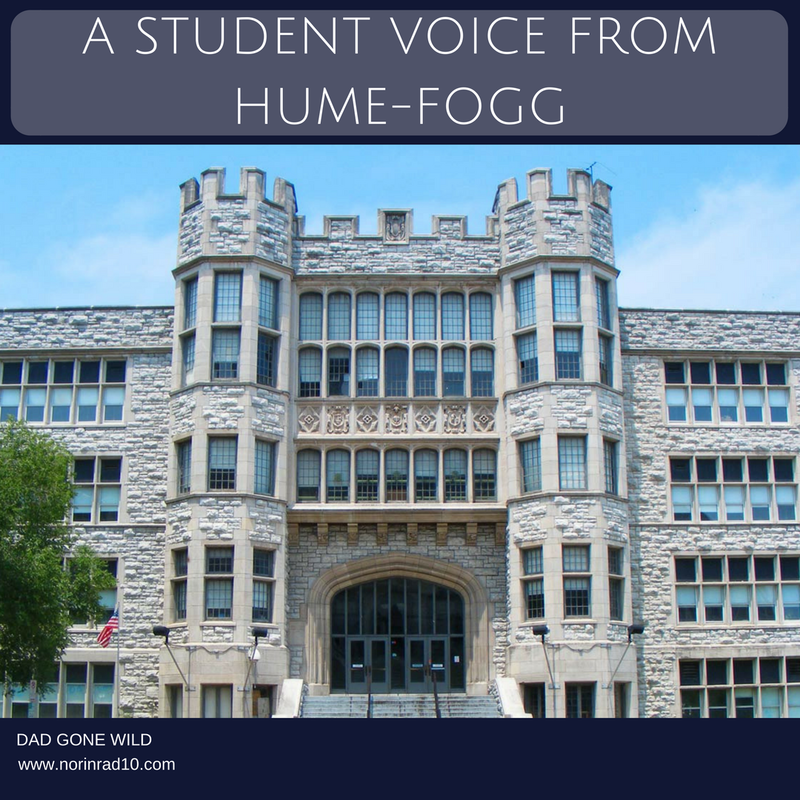 Hume-Fogg is an Academic Magnet School here in Nashville Tennessee. It is consitantly ranked near the top for public schools in the state. Recently Metro Nashville Public Schools has been changing it’s budgetary formula causing many schools to acing very tough decisions about what programs and personel they will be able to fund. Since Hume-Fogg is a magnet school we tend to assume that they recieve funding at will. The reality is that they recieve the basic per student funding and then qualify for very little of the money added for servicing special needs students. Magnet schools often get bad rap for their percieved elitism and here in Nashville there is a long brewing conversation about their relative worth. That doesn’t mean they don’t serve real students that have very real needs and that we don’t owe it to them to take those needs into account. Below is a letter written by the students of Humm-Fogg. I am always impressed when students are willing to step up and enter the fray for what they believe in. It doesn’t matter if it’s in defense of a football coach or to demand that the district honor it’s promises or even if it’s in defense of a beloved program that may not seem that relevant to us adults. In the end, it’s their education and they’ve ggot a right to have their opinions heard and I applaud them for taking ownership. I’m deeply honored that the students of Hume-Fogg have choosen to ask me to help amplify their voice. Please read their words below and if you can, offer them some support. They deserve it. It has been recently decided that due to a funding deficit for next year’s school year, the German program at Hume Fogg Academic Magnet High School has been cut altogether. As a German student, I and my peers deeply oppose this decision and we want to save our amazing program, which has done wonders to enrich our understanding of the language and the world around us. Since the founding of Hume Fogg as an academic magnet school, German has been an integral part of the curriculum. For decades the German program has distinguished itself both in the region and nationally through results on the National German exam and the AP German exam. Students have received free scholarships to study in Germany; participated in exchange programs; won numerous awards at regional competitions; traveled to Germany, Austria, and Switzerland and received numerous academic honors as well. For example, 40% of our students have placed in the top 30% of the country annually on the national German Exam with 80% placing above the national average. The AP German pass rate since 2011 has been 100% every year. Considering the fact that it is one of the most, if not the most successful AP class offered at Hume Fogg, it is confusing that the entire program would be done away with. We are hoping to reverse the decision to reduce Hume Fogg’s budget, considering we are already one of the lowest funded public schools in Metro. Our German teacher has deeply impacted every single life of every single student that she has taught. We are hoping that through emailing the Metro School Board of Education and our district representatives, attending PTO budget meetings, speaking at the Board of Education’s meeting on May 9th, and holding a public protest, we can save the amazing German program at Hume-Fogg. After doing some digging, it seems that the issue in question arises from the deminishing interest in German as a second language. Which pains me to say because I studied German in school and consider myself a German speaker. The district will not offer German 1 next year but will make sure that course offerings are available to all students who have started their pursuit of the German language. The teacher, unfortunately, is a victim of certification. She isn’t certified in any other subject which makes it difficult to transition her. It’s a shame because I do believe in the result will be one less adult deeply vested in the success of the students at a time when every adult is needed. It’s always been my belief that part of a well rounded education is the studying of a second language. French, Spanish, and German were always offered during my educational career. Catholic schools, if I’m not mistaken, still offer Latin. It’s curious to me that as the world becomes smaller, language studies are among the first subjects cut. Hopefully these students won’t give up and will couple their efforts to convince the administration that the German department is neccesary with efforts to recruit incoming freshman into the love of German as a second language. Whatever the outcome, I thank them for granting me the privilege of amplifying their voices and will do so again whenever the opportunity is provided. The students and families (and anyone else) who wanted to speak on May 9th were not able to do so because there was not enough time for them to get on the list. They plan to be at the Board of Education meeting that is open to the public on May 16th, so PLEASE show up or send e-mails to the Board in favor of keeping the AP German class. The school has agreed — and arranged, I believe — to keep the 2nd year German class for students to complete their 2 years of language study needed to receive their high school diploma. HOWEVER, at this time there is NOTHING in place to allow the AP German Language class which rising Seniors have already registered for. PLEASE know that parents are offering to help pay — if that is an option — for this AP class to be covered. Our students are applying to colleges with the AP German class already registered for and the success of that program as reported here is known to the colleges/universities to which our students are applying. THANK YOU!